Everyone’s getting serious about storage. We often hear that energy storage is a few years behind the solar industry. Comparing these industries’ respective trade shows helpfully illustrates this point. Solar Power International drew 18,000 people to Las Vegas in September, with panels sprawling throughout the convention center and two massive expo floors. There were espresso bars, two-story display stands and plenty of lights, shiny things and after-parties at swanky Vegas nightclubs. By contrast, the 2,000-person Energy Storage North America in San Diego last week felt quiet and provincial, closer to a hometown parade than a county fair. The expo had some familiar names from SPI, but focused more on fostering conversations between like-minded storage wonks than on wowing an audience with bells and whistles. Many of the conversations at the conference dealt with how to put storage on track to where the solar industry is now. Most of the air time went to addressing policy and regulatory obstacles so that the existing storage technologies can get paid for the services they provide. There weren't any earth-shaking revelations, but a steady march toward the boom that the industry and its observers have predicted. Here are a few of the insights stumbled upon while wandering the halls. At the state level, California has long dominated the storage game, having passed the first statewide storage mandate in the U.S. back in 2013. Employment in the storage industry is correspondingly concentrated in California. This summer, the Massachusetts legislature authorized the state's Department of Energy Resources to decide if it thinks a target would make sense. That same department released a study last month saying that up to 1,766 megawatts of storage capacity would provide a net benefit to ratepayers, so chances are good that a target will become reality. This, plus New York City's new 100-megawatt storage target, creates the strong possibility of a high-growth market in New England. There's already a cleantech hub around Boston, and companies based there will be well placed to nab new contracts. The opening of a new market there could create space for new companies to jump in as well. With no hard numbers on the table just yet, it’s too early to know how much business will actually materialize. At a high level, though, storage will be going bicoastal in a few years, and that's very good for the industry. One thing became very clear while walking around the advanced energy systems at the University of California at San Diego: You can go far when you control your own microgrid. The campus remains connected to the broader grid, but has responsibility for everything within its territory. That means the school can fast-track its own permitting for experimental installations and tackle multiple, disparate needs with a single project. For instance, the campus generates electricity with a 2.8-megawatt fuel cell powered by waste gas from the city. This process happens to produce a lot of heat waste. Since the campus also has ample heating and cooling needs, they hooked up the waste heat from a generator to a water chiller, which is then pumped into a multi-story insulated tank hidden in the middle of a parking garage. This cools the buildings on campus, reducing the need for electricity to power conventional air conditioners. That kind of joint operation is beyond the scope of most utilities. Similarly, since the university both produces power and owns the land, it has been able to launch several test sites for advanced electric-car charging. In one of them, EVgo has paired used EV batteries from BMW with public charging stations to moderate the demand charges they incur. The company is also launching a vehicle-to-grid project to explore the value of accessing a car’s stored energy while the driver is at work. UCSD is a special case, and most communities don't have the power to isolate themselves and do all this planning under one roof. The alignment of different needs in a single project holds great benefits for the grid and for efficient use of taxpayer or ratepayer dollars. Hopefully this approach continues to spread. Demand-charge reduction has been a major driver of commercial and industrial energy storage. The charge for monthly peak usage can add up to half a company’s electric bill in California. But demand charges apply to residential customers in a growing number of places, so storage vendors are adapting. San Francisco-based battery maker Sunverge launched a new residential demand-charge management program to do just that. Whereas time-of-use batteries just need to adjust their operations based on the times when higher prices kick in, the new demand-charge software takes a more sophisticated modeling approach to know when to charge and discharge the battery to avoid crossing a peak threshold. As more utilities deploy demand charges for residential use, additional storage companies will no doubt roll out their own mechanisms for flattening a household’s demand. It will be interesting to watch what kind of head-start Sunverge gets from an early launch. They’re a lot like other stationary batteries, but these ones have the Mercedes-Benz logo. Daimler introduced its residential battery in Germany earlier this year, and it will be available stateside early next year. The modular system stacks from 2.5 kilowatt-hours up to 20 kWh and comes with a 10-year warranty. The lithium-ion batteries use the same nickel-manganese-cobalt chemistry as the Mercedes electric vehicles. Accelerating and decelerating puts more strain on batteries than stationary usage, so they should be robustly suited for household deployment. Aesthetically, the battery looks like a high-end kitchen trash can, but its casing is metallic gray and comes with that shiny, silver three-pointed star on top. It will no doubt add a touch of European sophistication to the often-neglected interior of the American garage. Borrego Solar has been putting up commercial and utility-scale solar installations for 35 years. Now its customers will have the option of pairing them with storage. 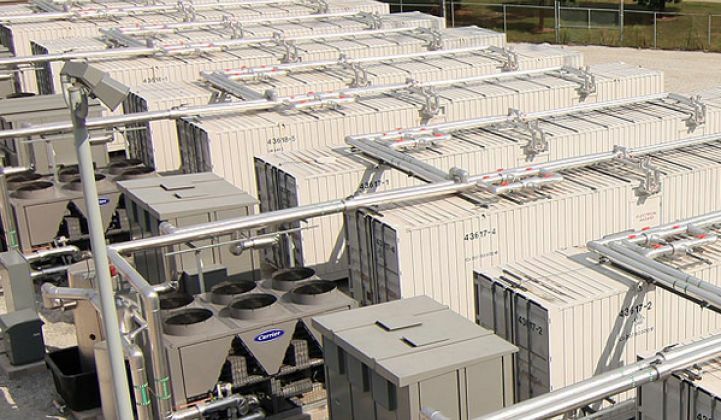 In announcing the new energy storage division, led by Dan Berwick, the current executive vice president of strategy and business development, the company noted that its core markets of California, New York and Massachusetts have been encouraging solar adoption and now have to grapple with ways to store variable generation on the grid. "The long-term systematic need for energy storage solutions, combined with the reduction in costs, growing supply of battery technologies and emerging market structures in our core markets create an undeniable opportunity for our customers," the company wrote in a statement. Borrego's target audience is utilities in search of megawatt-scale storage, as well as large commercial customers, with or without solar. The company will remain technology-neutral and integrate storage based on the needs of the customer. Since Borrego has been working with financiers and institutional investors for the previous solar projects, it will offer third-party financing for leased storage systems. The company also promises a "storage PPA" offering that would involve paying for storage as a service rather than a product. Difficulties in financing storage projects have driven away lots of customers in the past, and third-party financing is seen as crucial to scaling the market; Borrego seems to be getting out in front of that trend. Borrego has weathered a lot of storms that took down other solar companies along the way. Its entrance indicates the storage industry is looking more like a sure bet than a gamble. Borrego doesn't want to see its large-scale solar customers going to some other company for storage.